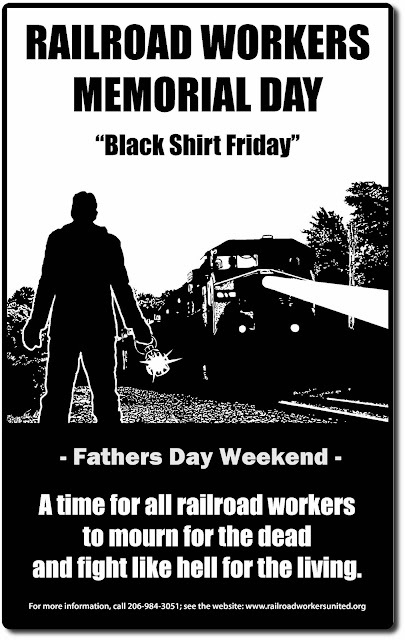 railroad workers are encouraged to wear black to work as a sign of remembrance and recognition of our fallen brothers and sisters who were killed on the job over the course of the previous year. Sponsored by Railroad Workers United, each year the event focuses on a specific theme. Because of the large number of contract and non-union railroaders who were killed the past 12 months, this year’s Railroad Workers Memorial Day will focus on these workers and their plight. Those non-union and contract workers killed this past year include: a contract worker involved in track work on Canadian Pacific near Forreston, IL; a train crew member of The Western Group, while operating a train near Roswell, NM on former BNSF territory; two employees of a contract railcar servicing outfit while performing service in Omaha, NE; a trainman spotting cars at an industry in Pine Bluff, AR; a contract worker for BNSF unloading rail cars in Kansas City, KS; a conductor making a switch move for Alabama Warrior Railway in Birmingham, AL. Throughout our history, railroad workers have organized into unions to improve our wages, benefits and working conditions. Improved safety has always been a major reason for railroad workers to organize. Rail carriers – like other corporations - have historically resisted employee organization and the associated demands for better wages, benefits and working conditions. In recent decades, rail carriers – once again like many modern corporations – have devised a means by which they can circumvent the largely unionized railroad workforce. It is known as “contracting out”. 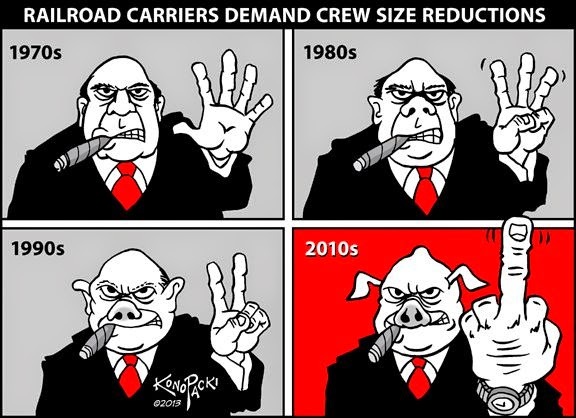 Rather than keep the work in-house, the big rail carriers have opted to farm out all types of jobs to smaller, mostly non-union outfits that all-too-often offer their employees low pay, few benefits, and miserable unsafe working conditions. Class I railroads have contracted out everything from locomotive servicing to track construction, weed spraying and brush trimming to car repair, rail inspection and train crew transport. It is hard to say just how many jobs have been contracted in this manner, in the tens of thousands perhaps. This is bad news for all railroad workers and it is an issue of grave concern to the future of our industry, our working conditions, pension, and crucially, our safety and health. The railroad industry proudly touts its safety programs, the declining numbers of on-the-job “reportable” injuries and so forth. However, this disingenuous posturing ignores the fact that the railroad is engaged in contracting out work to outfits that often have poor safety standards and records. These contract companies employ workers – usually on the railroad’s property -- to perform the exact same work that was once performed by railroad employees. But now cynically, the railroad takes no responsibility for these workers because they are no longer in the railroad’s direct employ. 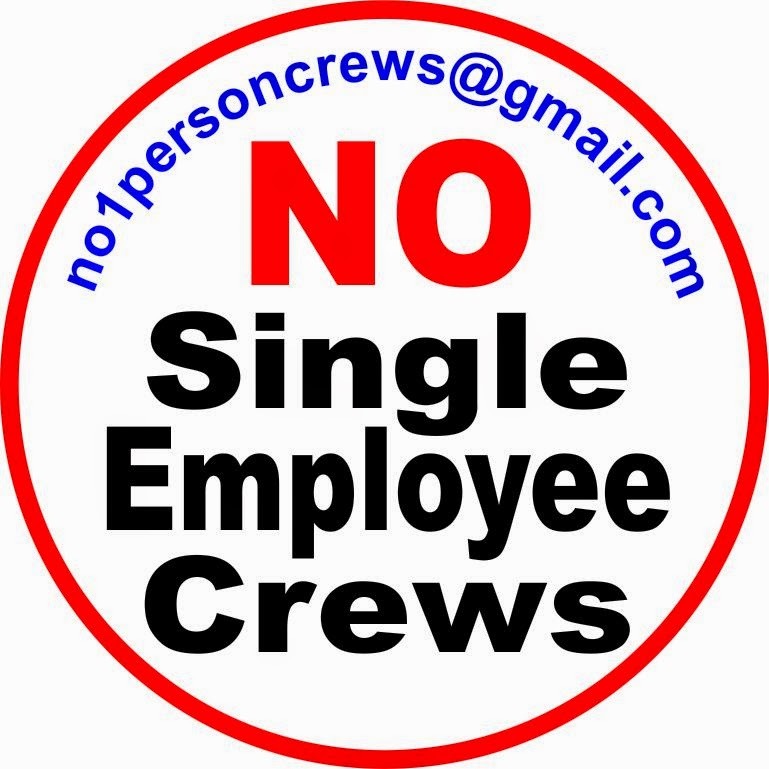 The rail carriers’ attitude towards these workers is that the company is not responsible for their health and safety – even though they are on railroad property, performing the same essential work that was once done by our own employees, working in safety sensitive jobs, and making profit for the company’s bottom line. Also, the carriers know that many accidents and injuries of contract workers do not have to be reported to the FRA. Just because the people servicing the locomotives, cutting the brush or driving the train crews are no longer directly employed by the railroad does not mean that union railroaders should turn our backs on them. Not only are they our fellow workers who work right alongside us, but our very ability to thrive and prosper is intrinsically linked to theirs! The rail labor unions must resist this “de-unionization” of these jobs, and begin to aggressively organize these contract workers. Therefore, RWU will continue to reach out and support the efforts of all contract railroad workers to organize into a union, and we hope that all railroad union members understand that our safety is directly linked to the safety of our brothers and sisters in the contract sector..
Let’s Not Forget Our Brothers on the W&LE - Fighting for All of Us! While the fight against the BNSF attempt at engineer only operations was big time news amongst rail workers, our brothers at the Wheeling and Lake Erie (W&LE) remain on the front lines of this critical battle, soldiering on in relative obscurity. For several years the W&LE has been aggressively pushing engineer-only trains, and the conductors and engineers said “no thanks”. On September 13, 2013, the carrier began to run engineer-only with a manager behind the throttle, no less. In response, the BLET represented members of BOTH crafts – conductors and engineers - went on strike September 20, 2013. The strike shut down the regional carrier’s operations in Ohio and Pennsylvania before the 100+ union members were ordered back to work by a temporary restraining order. Since that time, the W&LE remains intransigent on the engineer-only issue. The workers there remain defiant, but they have now gone seven years without a raise. Simply put, the W&LE is attempting to economically bludgeon our brothers and sisters into submission. They are no doubt feeling the pain; who wouldn’t? This is an outrage!!! If the W&LE has their way, the major Class 1 railroads will get a much needed boost in their attempts to run engineer-only. So the stakes for all of us rail workers is a no-brainer. By logical extension, the general public has a vested interest in safe railroading operations. As some state legislatures and corporations are trying to housebreak our unions at best and bust them at worst, this is one of several battlefronts that the entire working class has a stake in. They deserve and need the solidarity and support from all of us -- rails, other workers, and the general public. At the BLET convention last October, a rank & file delegate proposed the following resolution from the floor. It carried with unanimous support (minus one “No” vote). 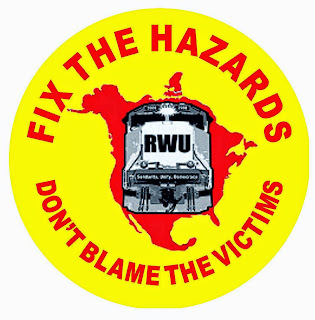 RWU encourages all railroaders of all unions - BLET or otherwise - to push adoption of similar resolutions in your respective locals. Then forward them on to RWU. We will send them on to the Local #292 leadership to let them know they are not alone, and that we all have their backs. Our conferences are starting to make people think! We RWU folks wanted to address the issues.. So we invited all people to our conventions out in the Pacific NW and the bay area of California.. for some, the issues center around keeping the planet safe from fossil fuels.. some folks have issue with corporations profiting billions and then leaving communities with the mess to clean up..
Railroaders know that there is no other way to safely transport the millions of tons of hazardous materials that we move.. Railroaders also know that coal and oil are not the only things that needs to be transported safe... finding common ground is a hard thing to do. I am proud that my organization has the courage to discuss these sets of issues with environmentalists..
Moving forward RWU has made alliance with several groups.. some national in scope and some local. There is already one thing that all these groups have in common.. They are all worried. Everyone should be worried that the Railroads are hell bent on running One Person Trains!!! While railroaders might not agree on the politics or agenda of some of the groups that we invited to our conferences, there is common ground to be found. We railroaders move almost everything that is consumed in this economy. Our railroader issues are the issue of every person that lives in the communities that we service and travel through. In this dysfunctional political environment where corporations and the powerful have preferential access to our Democracy, many of us at Railroad Workers United understand that it is "We the People" that the railroads should be asking if it is OK for them to Run One Person Trains. 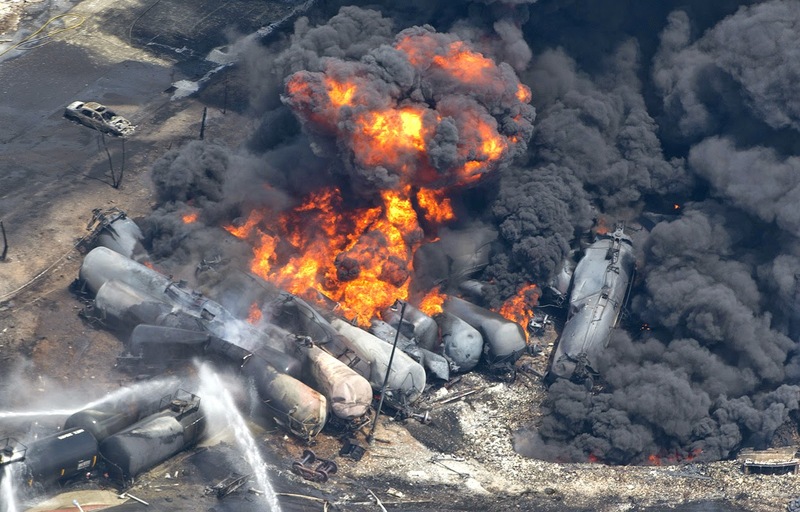 Most everyone in North America knows that it is not safe to Run One Person Trains! The people who live in this country love their trains, and clearly recognize corporate greed when they see it. Workers and Communities need solutions. We all need good paying jobs. We all need access to other communities. We the People should be the ones setting policy. If safety is truly Job number one.. then RWU is on the right path. We must rally around safety. We must ask more questions, we must continue to bring railroader issues to the public. Politicians make policy in fear of the powerful... so Railroad Workers United will continue to work with WE THE PEOPLE and empower them with an educated voice! For more information or to make contact with us..
Be in Further Resolved that RWU supports a nationwide campaign to combat the chronic fatigue and excessive work hours that North American railroad workers are subject to. Be it Finally Resolved that RWU calls on community organizations, civic groups, environmental organizations and labor unions to join with us in this important fight against train crew fatigue. 120 years ago Eugene Victor Debs stood six blocks from here at Langley Park and pledged the support of his brand new union, the American Railway Union to the struggle of the Pullman car builders. The ARU had just decisively defeated the Great Northern Railway in 18 days preventing a 10% wage cut. Now, this same company the Burlington Northern Sante Fe, is demanding concessions just as drastic. I came here today to ask you to help these present day rail workers in this fight. Take a look at those tracks west of this building. You see that the freight trains are as long as 2 miles, with more than a hundred cars, including oil, explosive chemicals, even radioactive materials. But if the BNSF RR gets its way, in just 4 months, there won't be 5 crew members as there was 25 years ago, nor 4 or 3 or even the present day 2 crew members-an engineer and a conductor but only one lone employee in the engine! 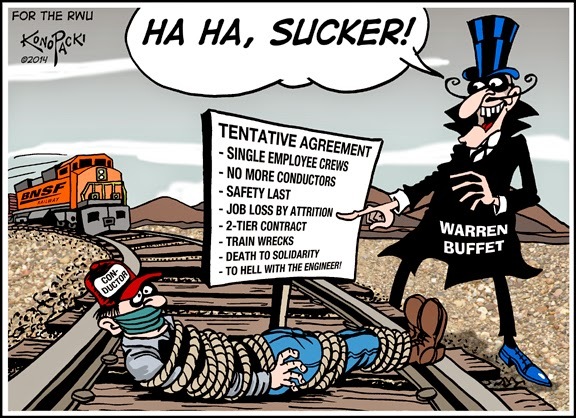 That’s right, on July 16, The BNSF and Warren Buffet along with the SMART (sheet metal and transportation Union General Chairman’s committee), behind the backs of the membership, sprang a tentative agreement on them which would eliminate all conductors from the locomotives, putting them in a van somewhere on the ground and leaving the engineer alone to run the train! If this passes in 7 days, that will be the result. I ask you, how will you like it when you hear the hundreds of cars rumbling through Pullman (and you may hear one before I finish this speech), past your houses, your children s schools and your parks operated by one person forced to work 12 hour days, on call 7 days a week, 365 days a year, sometimes 28 days a month! Up to ninety per cent of the conductors will be eliminated and forced to train as engineers so they too can work alone. The company claims that a GPS type satellite system, not yet implemented, which doesn't work yet, will keep you and your family safe. Cicero, here near Chicago, in informational meetings, they are campaigning for a no vote. The bureaucrats have gone so far as to cancel meetings, call hotel security on us supporters and even call the cops on their own members! I hope next week, this attempt will be defeated, but you can bet Warren and his boys will be back for another try. On the railroads in 2014, we are slaves as we were when Gene Debs was here in Pullman. How can we be anything else when it has been established by both democrats and republicans that congress will pass a law each time to prevent us from using what should be our sacred right to strike? I appeal to you now to build a coalition of community members, environmentalists who want a safe planet and the rest of labor to support these modern day Pullman workers in their fight! What a more fitting tribute to the legacy of A Philip Randolph, Eugene V Debs, and the generations of brave fighters from right here in the Pullman neighborhood, would it be, to continue the struggle for goals long sought but not yet achieved, for respect, pride and a decent life for railroad and all working people everywhere we live. The "Battle has just begun! I have been numb for a couple of days about "our" and "their" victory on the BNSF against a contract that would have allowed for one person trains. I feel like David has hit Goliath squarely on the face and yes... he is hit, and.... Railroad Workers United played a very serious roll in this campaign, but I am reluctant for our organization to take credit for the "action." While I do know that many of our activist, some who put their jobs on the line, were seriously helping to fan a flame that has long been smoldering, analysis and strategy is needed. Is it Warren Buffet, the Berkshire-Hathaway hedge fund owner of the BNSF railroad? Is it the "Business" union structure that created the environment that allowed this contract to come about? Is it a membership that has become very apathetic and reluctant to "get involved." Is it a Federal Railroad Administration that has historically been very reluctant to make strong regulations. Is it a "robber barron" industry that has long controlled Washington? All of the above and more, is Goliath. Who is David? that is the question! The motive of the railroad industry for decades has been a reduction of crew size. You can bet that the strategy sessions are going on at the labor relations level. There is a union political environment that is also at work here. This is a "war on workers" and there will be a "last man standing." The wheel of history is turning and there will be massive changes to work rules. There will be more battles to wage. There is a fire burning and we must keep it lit. I am inspired, and i can feel it in my blood. There is a power that comes from a victory, but the forces we are up against are very,very powerful. The BNSF conceded, and said they will respect the workers mandate. But fellow railroaders don't be fooled. Remember from where this attack came. The union and the company, think about that. It would be SMART to remember that the Brotherhood is at an impasse on the W&LE out in Ohio. Goliath has been on a rampage against 100 Teamster represented fellow railroad workers there for may years now. Now that the front has quieted in the west, shouldn't we turn our slingshots in that direction? If an arbi "traitor" settles that fight.. We are in serious trouble. The W&LE has not conceded. Brothers and Sisters, Fellow Railroaders.. the fight ain't over.. it has just begun. In our hands is placed a power and there is no greater power than the union. Are you ready David? Goliath will be back.